on november 10, the central electricity regulatory commission (cerc) issued the draft guidelines for sale/purchase of renewable energy certificates. The proposed guidelines, open for public comments, may be finalized by the year-end. Issuing renewable energy certificates (rec) is a mechanism developed by the regulators to help states meet their targets for utilizing power from sources like solar and wind energy. 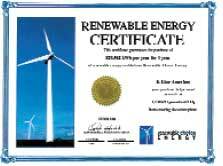 Each certificate is a proof that one-megawatt hour (MWh) electricity was generated from a renewable energy source. Producers can trade them in the power exchange. The National Action Plan on Climate Change (napcc) has set a renewable energy consumption target of 5 per cent for all states for financial year 2011-2012.Not all states have renewable energy sources to tap or the money to invest in it; such states can meet their targets by purchasing recs, a cerc official said. Under the proposed guidelines, electricity generated will have two componentscost of electricity and environmental attributes that represent the cost difference between energy from renewable sources and cheaper sources like coal. With each MWh power uploaded on the grid, the environmental attribute can be redeemed for an rec. The rec price will be decided in the power exchange (just like shares in the stock exchange) but subject to a ceiling price decided by cerc.